The field was much as normal when the F1 circus gathered in Zandvoort. The Brabham team had its new Repco V8 engine ready and was running a third car for Dan Gurney who had no Weslake engines available for his Eagle. 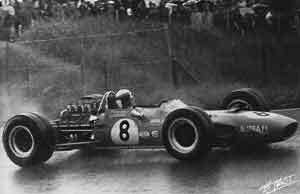 Cooper ran only one car for Lucien Bianchi following the death of Scarfiotti and Brian Redman's accident at Spa a fortnight earlier. In qualifying Chris Amon was fastest in his Ferrari with Jochen Rindt's Brabham and Graham Hill's Lotus sharing the front row. Jack Brabham was on the second row with Jackie Stewart (Matra-Ford) while the third row featured Jacky Ickx (Ferrari), Denny Hulme (McLaren) and Bruce McLaren (McLaren), the last-named having won the team's first GP a fortnight earlier in Belgium. The weather was bad all weekend and it was raining lightly at the start. Rindt took the lead but he was in third place by the end of the first lap, behind Hill and Stewart. The rain intensified and on lap four Stewart moved into the lead. He quickly built up a big lead while Hill came under pressure from Beltoise who had moved quickly through the midfield. On lap 23 Beltoise went off and had to pit to clear his throttle of sand and so he dropped back to seventh. When he rejoined he quickly moved up the field, passing Gurney, Ickx, Amon and Rodriguez to get to third place. On lap 50 he overtook Hill for second place. On lap 61 Hill had a spin and dropped to fourth behind Rodriguez. On lap 82 he did it again but this time had to retire. Stewart led home Beltoise to give Matra chassis a 1-2 result with Rodriguez third for BRM. Ickx was fourth for Ferrari while Silvio Moser survived to finish fifth in his private Brabham, although he was three laps behind the winner.